Acure is one of the top names in natural skin care, while I have tried a few of their items over the years and had great results from them, I have fallen completely head over heals in love with these Argan based products. 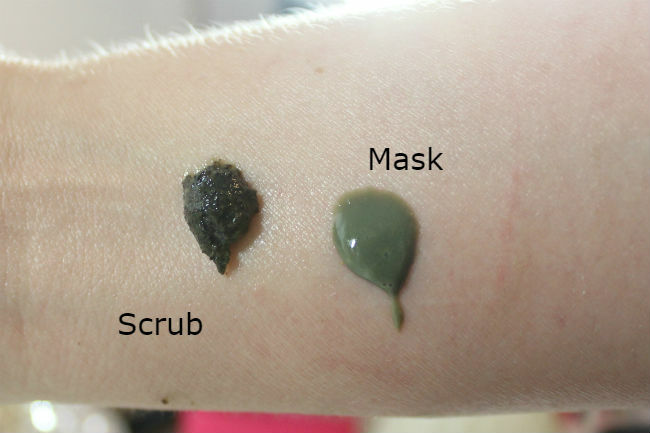 This scrub features Argan extract and Chlorella Growth Factor (which comes from the stems of the chlorella plant) to help brighten and hydrate the skin and French green clay to purify, lemon peel granules to exfoliate and scrub the skin and Madonna lily extract for evening out skin pigmentation. It is also is packed with anti oxidants like Acai fruit extract and Blackberry extract, just to name a few. This scrub goes on pretty darn green (that's the Chlorella growth factor in it) and feels nicely gritty (not too much or too little) that I can get a good scrubbing on my face without irritating or overdoing it. It rinses nicely too without leaving your face green. 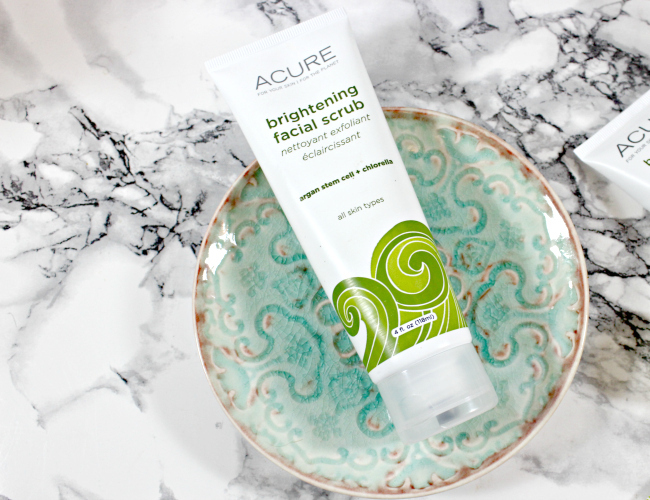 Whenever I have used this scrub I have followed it up with the Brightening Mask, but I have loved how smooth my skin feels after using it. Sometimes when I use a scrub I feel irritated and red despite my attempts not to scrub too hard. I believe so many scrubs have just too harsh and jagged granuals in it, but this Brightening scrub is just amazing in how it scuffs off my dead skin while not irritating it at all, it actually feels nicely soothed when I am done using it. 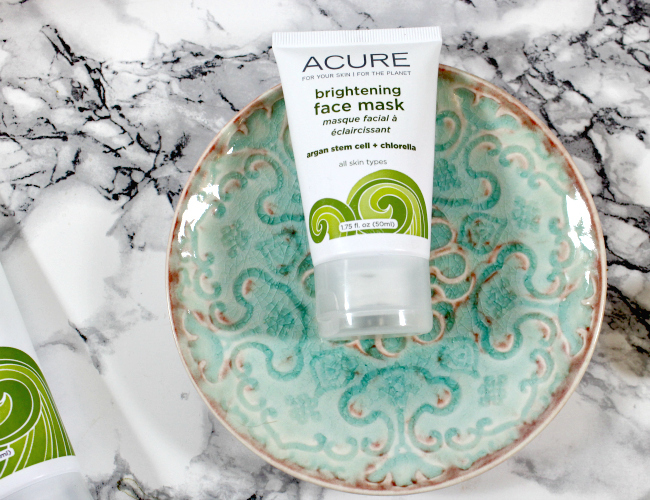 This mask partners up amazingly well with the Brightening Facial Scrub (they are in the same line), it features many of the same ingredients, Argan, Chlorealla, French green Clay, CoQ10, and many others. Like the Scrub, this baby leaves your face green, but even more so, which is both fun and a great bench mark to see if you have used enough. I do find I need a lot of this to get a good cover on my face and the tube is about 60% smaller then the scrub (which you need very little of), so I would love to see a bigger tube of it down the line. That being said I adore how soft and smooth my skin is every single time I use it. It isn't red and inflamed, it isn't dry and tight, both things that can easily happen with my skin when I use anything with clay or mud in it. It is just soft and glowy. Argan Oil is one of those things that I people usually associate with hair care and not skin care. I personally have been using Argan oil for my skin for years, but find most that are out their very heavy. 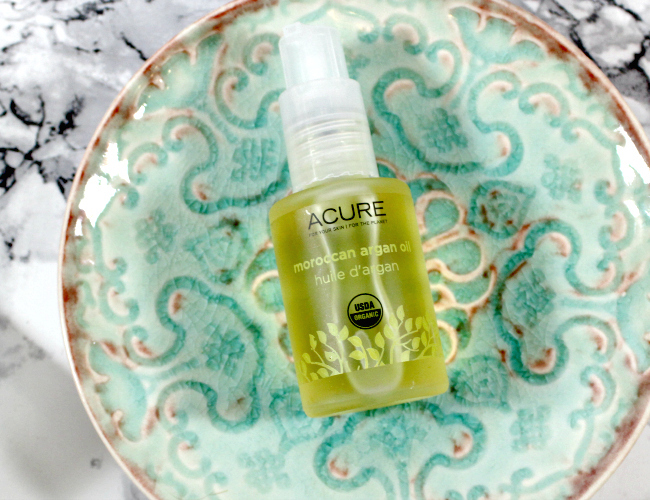 Acure Argan Oil is much lighter and as a result works amazingly well on my dry skin as well as my hair and body. What I love about an oil like this is that you can use it as a serum, mix it in with other lotions or creams to make them more hydrating in colder months but you can also use it on your body, hands and hair. Since it is such a multi purpose product it makes for a great travel buddy too. I also really enjoy that this one comes in a pump and not an eyedropper bottle, it makes for a much cleaner application and less chance of contaminating the inside of the bottle (or spilling, I usually spill things). My personal favourite way to use this is as a thin layer after my serum but before my lotions to my face, or adding a few drops to my favourite sleep mask to give it more of a boost when my skin is more dry. Although I do have many other ways I like to incorporate it into my daily routine. Overall these three products have been very good to my sensitive and reactive skin. The scrub gently buffs away my dead skin, the mask hydrates while purifying my skin and the oil is a true multi-tasker that helps keep my skin hydrated pretty much head to toe. 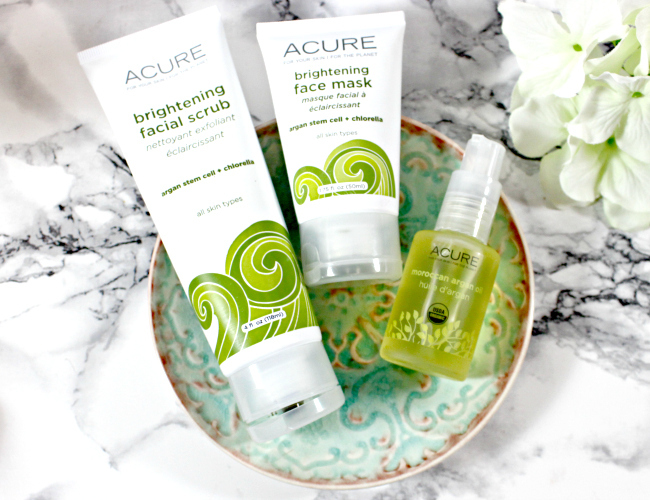 I love the Acure brand, it isn't just an organic brand it is a plant bases, vegan, sulfate free, paraben free, and cruelty free brand, which is just fantastic for anyone looking for the best in natural skin care. *These products were sent for review purposes, all views and opinions are my own.